Make a Greenhouse. You can make a greenhouse from any container you like, so long as light can penetrate its walls. 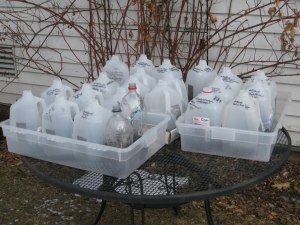 Like other winter-sowers, I use recyclables, including gallon-size milk- or water- jugs, and 2-Litre soda-pop bottles. 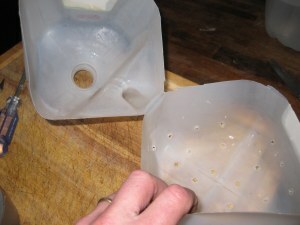 With jugs and bottles, use a pen-knife to cut around the middle, almost all the way through. The uncut half-inch or so will serve as a hinge. Next, punch out drainage holes in the bottom. A Phillips screwdriver, heated over a flame at the stove, will facilitate the hole-punching job. Punch out also a few holes along the top portion of the container. These extra holes increase air-ventilation. Ventilation, of course, is the key to preventing excess heat from building up in the greenhouse, and baking the seeds to death. If there is a cap on your jug or bottle, remove it. Select the Right Soil. It is essential to use a soil mix that drains well, and has a light, fluffy consistency. Pour the soil, preferably to a depth of 3 to 4 inches, into the bottom half of your container. Then moisten the soil thoroughly and let it drain. Sow the Seeds . Sow your seeds on the soil surface, and then cover them with more soil, when necessary, to achieve the proper planting depth. Gently pat the mix down, so that seeds and soil make good contact. Then replace the lid, and secure it with a strip of duct tape, as illustrated. 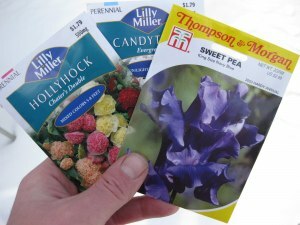 If you live in a cold climate, as I do, plant your perennial and hardy annual seeds first. Should these sprout during a weird warm-spell in winter, they will not be harmed. Wait until March to plant your tender annuals. More details here: What Seeds Are Best For Prepping. Remember to Label! For each sowing, indicate with a permanent marker (or a paint-pen) the seed variety and date sown. Do not omit this step, for there is nothing worse than finding, in spring, dozens of miniature greenhouses brimming with seedlings, and not knowing what they are! Bring the Greenhouse Outdoors. Your greenhouse, once planted and labeled, is ready to brave the outdoor elements. Select a location that is safe from strong wind, but where sun, rain and snow will be freely admitted. My assorted greenhouses go on the patio table, out of the reach of Lily the Beagle who would otherwise knock them over. For further protection from tipping, I place them in a large plastic box, with drainage holes melted in the bottom. Relax. Now sit back and let Mother Nature do her thing. As the weather chills and warms, your seeds will freeze and thaw. These natural actions loosen the seed-coatings. This is why advance soaking or nicking of hard-shelled seeds, such as Morning Glories and Sweet Peas, is not necessary when you winter-sow. At the first kiss of spring, but while nights are still freezing, seedlings will begin to emerge. Now is the time to check for water. Open the tops, and if the soil appears dry, moisten thoroughly but gently, so as not to disturb tender root systems. Then close the tops again. 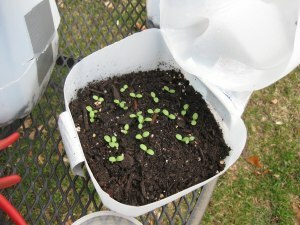 On warm, sunny days, I open the tops for hours at a time, and let the seedlings enjoy the fresh spring air. The tops, of course, are closed at dusk. I can’t tell you how advantageous winter-sowing can be. 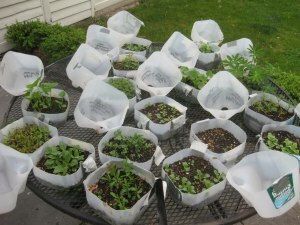 Last year I produced an entire garden’s-worth of perennials this way (far too many, in fact), without the need for light-systems, heating devices, or fancy seed-starting kits. And, unlike windowsill-germinated seedlings, which more often than not are frail and spindly, winter-sown seeds grow up to be strong, sturdy plants, completely prepared for glorious careers in the open garden. 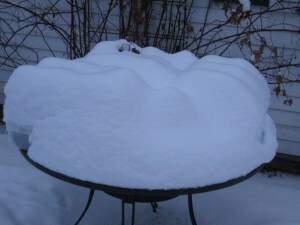 If I were you, I’d give winter-sowing a try. Honestly, it’s the easiest, most cost-effective way to achieve a beautiful garden. 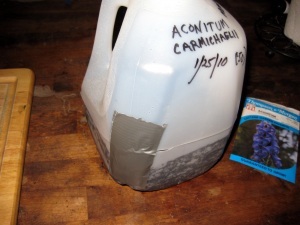 This entry was posted in Year Zero Survival Blog and tagged farming, garden, gardening, grow your own food, long term food storage, planting, prepper seeds, seeds, self sufficient, Survival food by staff-writer. Bookmark the permalink. Thank you so much for this! We are HSers who are teaching about heirloom seeds and non gmo seeds to our children this year. They have a real interest in growing tbeir own salad garden and vegetables. We’re hoping your method works for us in Ohio. We’ve had a crazy, warm winter so far this year. How do you safely remove the seedlings from the greenhouses when it’s time to plant them in the garden in the spring? I really like what you guys are usually up too. Such clever work and exposure! Keep up the superb works guys I’ve added you guys to our blogroll.